This idea first crossed my path on a Curbly post and they credit the idea to The Swell Life. There is a step by step tutorial at the Swell Life although this one is fairly obvious. It is so easy! I rescued a few bottles from the recycling bin. Mine were wine and soy sauce bottles! Spray painting was easy and the design makes use of the the beautiful gradations that occur naturally when using spray paint. To the painted bottles I added candles nestled in candy corn, mini pumpkins and waxed oak leaves. Tomorrow the extended family comes to dinner. We will be celebrating my Dad's 87th birthday on Monday. 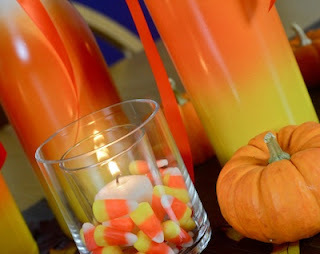 It was time for a new centerpiece and this one is fun and colorful! I haven't eaten candy corn in years. Both David and I have been enjoying the bag of leftovers. Thanks Alexa for sharing this great idea! I just love it when others take an idea from my blog (which I got from Alexa) and take it one step further. That is what blogging is all about - sharing ideas, learning, experimenting, growing. 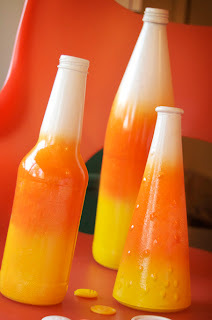 Here is a recent post starting from the Candy Corn bottles. 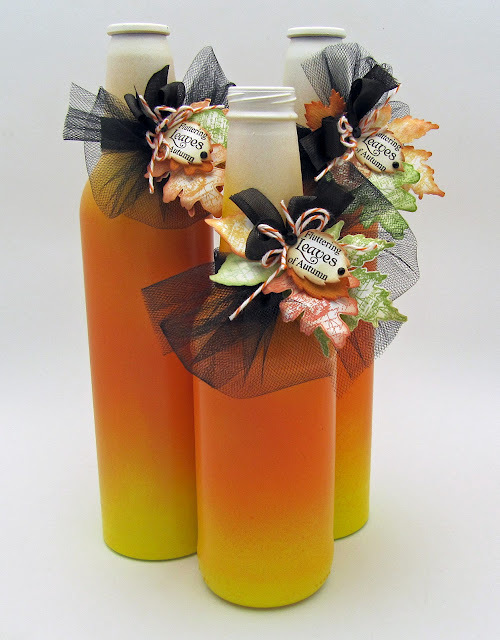 Barb Schram added some snazzy embellishments to the spray painted, recycled bottles. Check out her approach and website site with other projects here. Also, Michelle asked in the comments for more info on how I painted the bottles. I'll reply here instead of in the comments so I can add a few photos. I set each bottle on top of a lazy susan spice rack and slowly spun it as I applied spray paint to the bottle. I used gloss paint because I had that on hand. I wasn't taking process photos yet but I do have a photo of me using a similar technique when spray painting easter eggs. To spray the candy corn bottle start with white paint at the top. Remember, with spray paint it is better to use several light coats to avoid drips. This is especially true on glass. 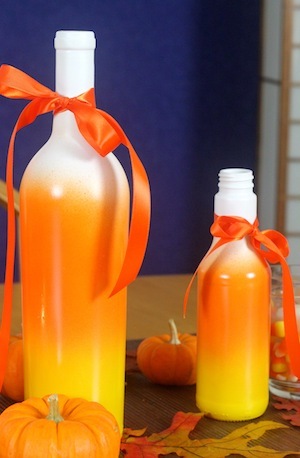 Once the white covers the bottle and has dried about 10 minutes spray the orange, being careful not to spray over all the white but leaving an area of partial coverage to provide the gradation. Once that covers and dries repeat with the yellow around the base. Having the bottle elevated on the lazy susan and being able to spin them makes this project very easy. Allow it to dry well before moving or adding embellishments. 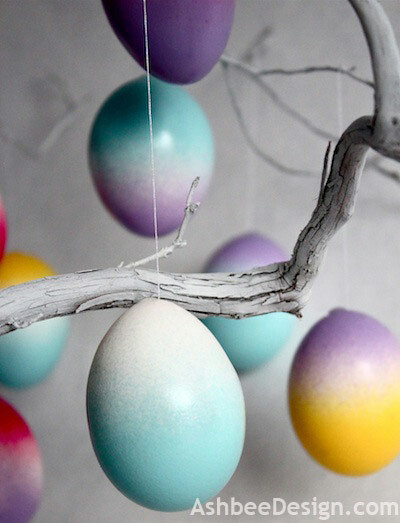 Click here to see the ombre eggs tutorial. Same process- different holiday!! Not sure why this is so popular in July. Hope lots of people are coming through to your website. My count is certainly up because of this post today. go figure! 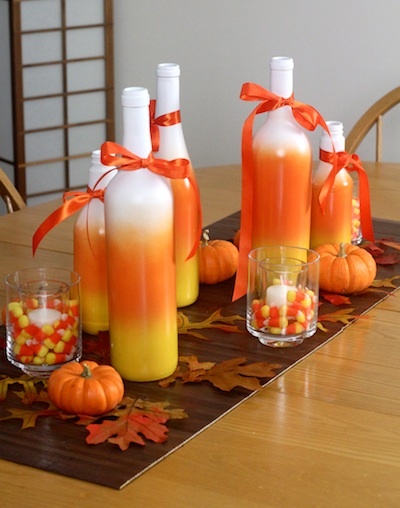 Just saw this on Pinterest--great idea! not sure how you paint the bottles? instructions? Michelle, I added some information on how I painted the bottles in an update to the post here. 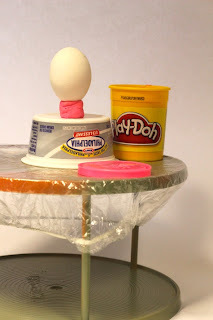 I also provided some photos and links on how I did a similar thing with Easter Eggs as well. How does the paint not scrape off? Certain paint? paint with primer? Lynn, I used Krylon indoor/outdoor gloss spray paint. I haven't really put these through any endurance tests. Because the are just centerpieces they don't get put in the dish washer or banged around a lot. Scraping off hasn't been a problem but I didn't try to scratch the paint off either. I love them. That is so neat looking. I tried spray painting using all purpose spray paint that was good for glass too. It was so messy and dripped so much. It was so horrible I soaked and scrapped the paint off. Can you give me any tips? I think you're spraying too heavily if it dripped so much. It's best to do several light coats - it doesn't get so sloppy.